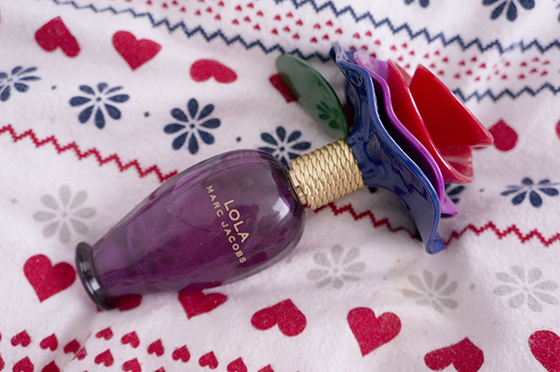 My new recent addition to my perfume collection is Marc Jacobs Lola. I bought it on a whim after my flatmate spirited it in The Perfume Shop and I couldn't get it out of my head. Lola includes notes of pink pepper, pear, ruby red grapefruit, peony, rose, geranium, vanilla, creamy musk and tonka. I find it very rose like at first, very floral with a hint of vanilla. It lasts a good ammount of time on as I find I get whiff's throughout the day without needing to top it up. The bottle itself is really showy-offy, over the top and cutesy. I think its super eye-catching and looks amazing on my dresser, although I can see some people thinking it might be a bit tacky but I personally like it. I personally really love it, I think it's interesting and different perfume and I really like it. I think its fairly safe but I enjoy it!